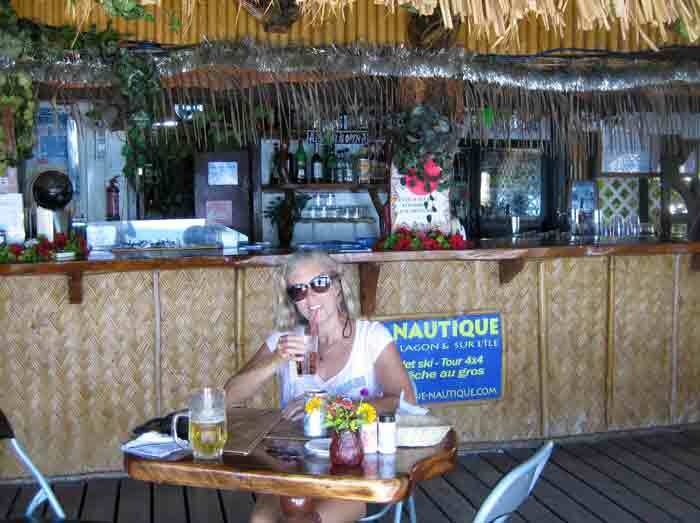 We have arrived at our favourite island to date- Huahine. This photo shows the ideal spot for anchoring, namely, anywhere you want to. These islands are a synthesis of the Marquesas with their majestic and dramatice mountains and the Tuamotos with their encircling protective reefs. The waters of the surrounding lagoons are calm and well protected from the high seas (and nasties like Tiger and Lemon Sharks are kept away). The main islands are beautiful and lush. 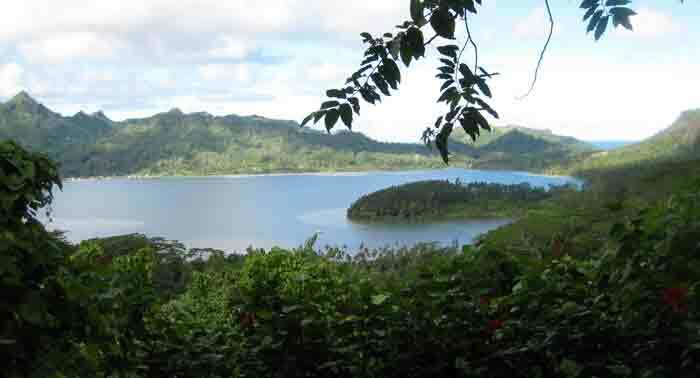 There are very few people living on Huahine so the islands are basically pristine. Our first night was spent in this anchorage just outside Fare, the main town. 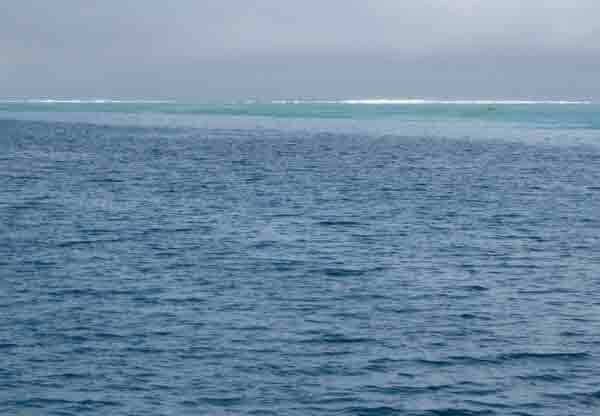 There is nothing in front of us but sand bottom and the protective reef. You can see the waves crashing outside the reef. 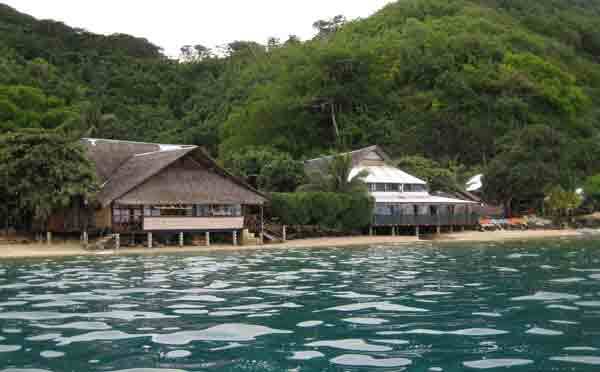 The next morning we motored around the lagoon to the southernmost anchorage, Avea Bay. This was heavenly. Picturesque, a couple of pensions on shore, mountains, sea, sand and wonderful snorkelling at the southern end of the island. 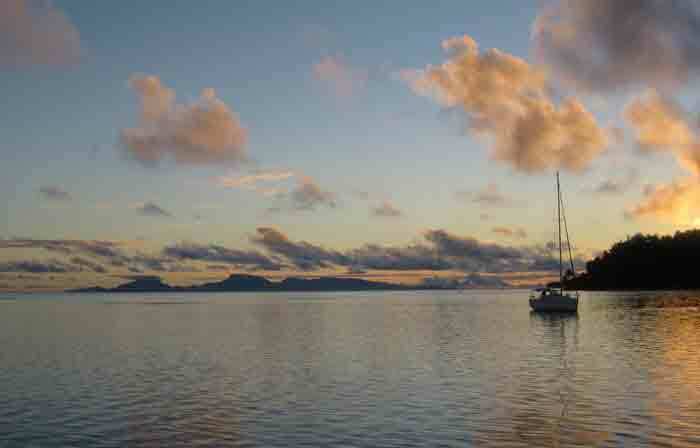 To top off a perfect day, we watched a fabulous sunset with Raiatea and Tahaa in the distance. The next morning we rented a car from Pension Maurarii and spent a delightful day exploring the islands of Huahine Nui and Huahine Iti. This is such an un-touristy place it was often difficult to find the "sights" because they were not posted! Our first stop was the Belvedere. 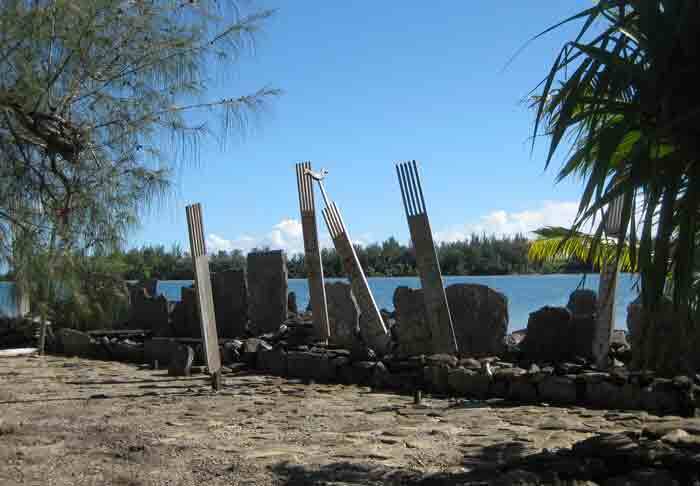 We actually drove right by it as we were expecting an iron-fenced viewing spot as in Moorea. This was just a simple gravelled lay-by with room for only one car. The views all around the island were as impressive as this one. Next stop was at Faie and if Lonely Planet had not mentioned it, we wouldn't have known to stop and look for the Sacred Blue Eyed Eels. On the downstream side of the bridge was a small pond filled with eels- up to 2.5 feet long. 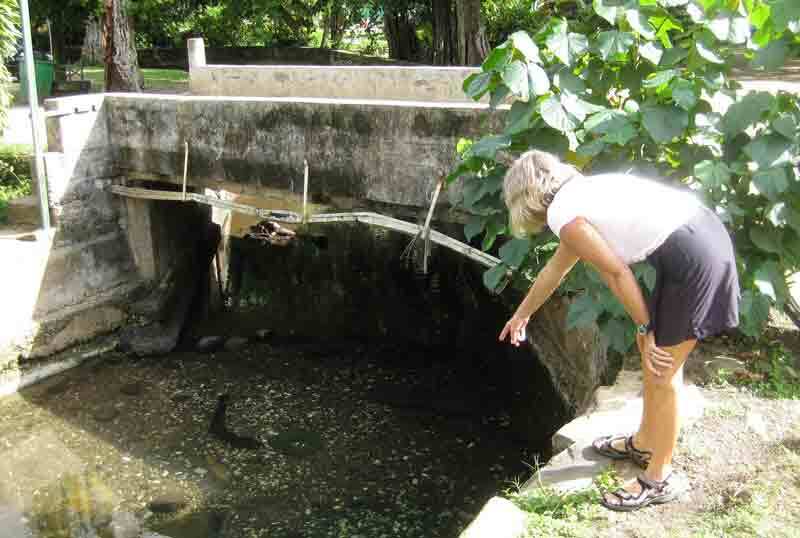 These eels have been fed for years by the village children and are basically tamed. The highlight of our tour was our stop at the marae sites at Maeva. 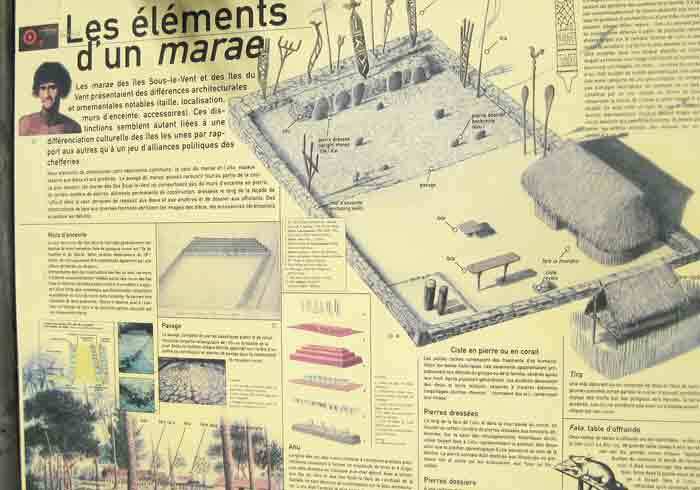 This is the most extensive archaeological excavation and restoration in all the islands of French Polynesia. There were no guides, no admission fees, just some very interesting and informative plaques explaining the history, types and accoutrements of maraes. This diagram gives a good idea of how the marae was set up. There were, however six types of maraes- religious, royal , public and family types. Their decorations varied a great deal. The carvings inserted between the outer and inner walls represented different wishes and purposes. These carvings represent fishing spears. Sometimes there were structures erected. This is a large one, probably created to house the religious leaders and relics of religious ceremonies. After scrambling among the maraes on the shore, we climbed up Pleasant wind Hill and "discovered" the maraes there deep in the forest and overlooking the bay from the hilltop. We never did find the vanilla farms advertised. 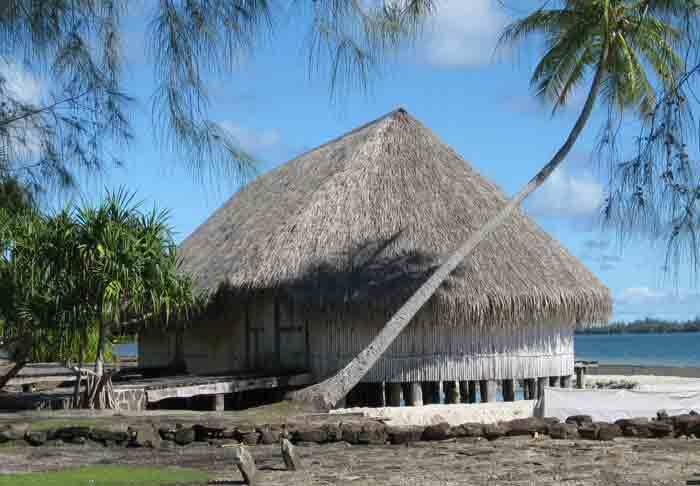 Apparently most of the Polynesian vanilla is grown on Huahine and on Tahaa. The plant is a form of orchid and the flowers and fruit spring from a vine. The vanilla beans here are some of the most fragrant and strongest-tasting in the world. 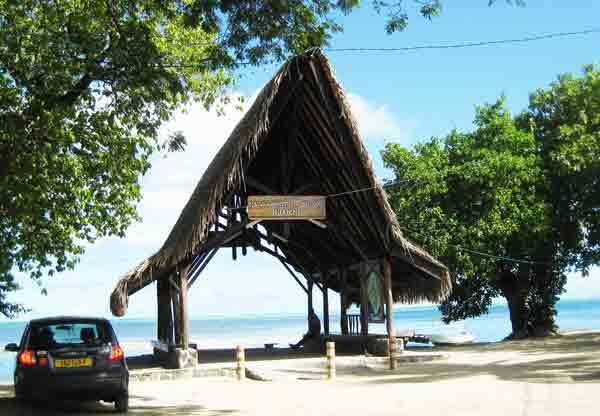 We stopped in the main town of Fare at a restaurant/ beach bar recommended by Lonely Planet. Once again they were spot on. The New Te Tehara served excellent food at reasonable prices. The view was lovely and the staff friendly and attentive. Although most of the menu was fish and seafood, we both had a craving for cheeseburgers. They were fantastic! Our little rental car and the wharf beside The New Te Marara restaurant. After buying a lovely pareo (colourful wrap that can be made into dresses, skirts, romper suits, shorts, etc.) and scavenging at the supermarket and searching for internet cards, we made our way back to Avea Bay for some more fantastic snorkelling and the opportunity to put our feet up! What a wonderful day and what a fantastic island!